surfaces while withstanding grease, oils, and grime. • Easy to write on with standard pens. • Convenient pocket-size, strip format. Available in multiple colors to highlite departments, month due etc. 8 sizes for every application. Clear cover protects the written information from tough environments. Clearly indicate that status of the equipment. Don't miss an important service interval. Space for ID, date, by and due for review. New shopping cart installed. Please report any problems or sugestions. You get the benefit of labels with clear covers at a lower price. Your net price is discounted based upon the quantity of each item you purchase regardless of color. Quantity discounts available at 25, 50 and 100 packages. Plus you are buying direct from the manufacturer! Orders for stock products ship within 1 day. After you enter your text on the label just remove the liner on the cover and apply over your label. 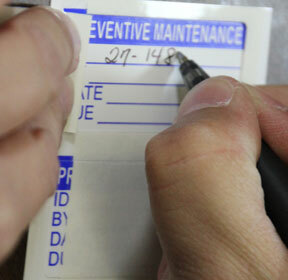 Now your label is protected from solvents, cleaners, water and misuse. You can even use a pencil for a durable label! The critical information is saved and your auditor will be happy. We can make labels exactly to your requirements. Special size or layout is not a problem. Put your company name and contact information on the label to ensure your customers keep coming back. The custom labels use the same durable materials used on our standard labels. Quantities can be as low as 250 labels per order. Click here to get started. - Mini size now in all 12 colors. - 0.75" round calibration labels added in green and blue. - Micro (0.375" dia.) 'FOR REF ONLY' now available with fixed cover, PN: QPL-038-02WC. We have moved to a larger location to better serve you. Still in Arizona but now in Prescott. If the instrument ensures that the correct amount of material is supplied to the customer, or if the measurement has an impact on the safety, reliability, or quality, you must calibrate that instrument and record it's calibration status. Download Technical Data Sheets for Certification labels. Copyright 2017. Advanced Calibration Label. All Rights Reserved.